The global market for cash-in transit bags is expected to gain momentum on account of the emergence of new players into the market. The competition in the market has been intensifying over the past years due to a range of strategies adopted by the leading market players. The relevance of cash-in transit bags has increased in recent times which has in turn generated huge market gap. The market players are expected to take advantage of this sizeable market gap in order to enhance their growth prospects. Furthermore, the market vendors are anticipated to focus on consolidating their position in the market by keeping a futuristic approach in all their endeavours. In other words, the business strategies of the players are aimed at acquiring long-term profits rather than short term gains. The leading market players are projected to rely on quality and durability of their products to gain a competitive advantage over others. The small and medium-sized players are expected to form strategic alliances in order to avert the competition from established market players. Geographical expansion through acquisition of defunct local players is also foreseen as a key business strategy of the leading market players. ITW Envopak Limited, Dynaflex Pvt. Ltd, Harcor Security Seals Pty Ltd, The Versapak Group, A. Rifkin Co., TruSeal (Pty) Ltd, Mega Fortris Group, Amerplast Ltd., Shields Bags & Printing Co, Packaging Horizons Corp, Coveris Holdings S.A, Nelmar Group, Adsure Packaging Ltd, Initial Packaging Solution Ltd, ProAmpac Holdings, LLC, and Leghorn Group are the key players identified in the global market for cash-in transit bags. 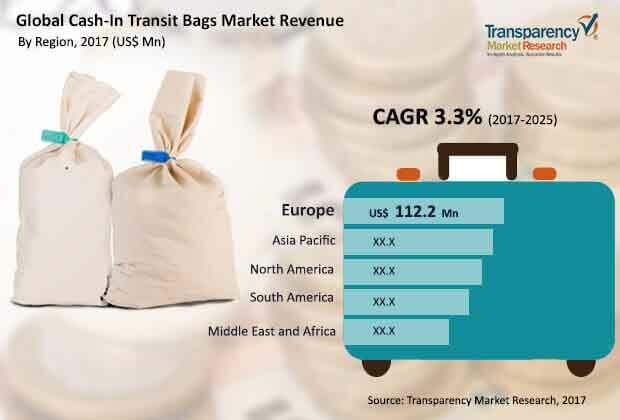 The global market for cash-in transit bags is expected to expand at a steady CAGR of 3.3% over the period between 2017 and 2025, finds Transparency Market Research (TMR). Furthermore, the market is expected to accumulate revenues worth US$ 452.2 Mn by 2025.? The global market for cash-in transit bags has been growing at the back for rising security concerns with regards to the transfer of cash or coins from geographical location to another. The manufacturers of cash-in transit bags have introduced safer, more secure, and environment-friendly bags that has given a push to the demand within the global market. Since the consumers have shown an inclination towards biodegradable products, the availability of biodegradable cash-in transit bags has given an impetus to the growth of the global market. Besides this, cyber thefts and scandals have shifted the focus on physical transfer of currency from one place to another. Owing to the aforementioned factors, the demand within the global market for cash-in transit bags is expected to reach unprecedented levels over the forthcoming years. Several online options for money transfer have emerged in recent times, and this has reduced the physical transfer of cash across regions. Furthermore, the installation of ATMs across the emerging economies has also affected the global market for cash-in transit bags. Cashless payment options do not come with the hassles of completing formalities of documentation and registration. This shifts the focus away from physical transfer of cash which in turn affects the global market for cash-in transit bags. The review is based on TMR’s report titled, “Cash- in Transit Bags Market (Bag Type- Deposit Bags, Shipping Bags, Coin Bags, Strap Bags, Stock Bags, Custom Bags; Material Type - Plastic Bags, Paper Bags, Fabric Bags; End Use -Financial Institutions, Hospitals, Casinos, Hotels, Retail Chains, Government Organizations, Courier Services, Academic Institutions) - Global Industry Analysis, Size, Share, Growth, Trends, and Forecast 2017 – 2025”.